For the past nine years, Big Ten Alumni Clubs have worked together to staff a water station during the Rock ‘n’ Roll Marathon. 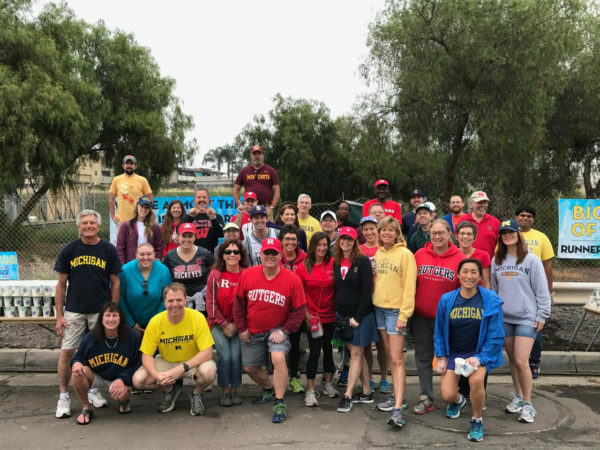 The event is an excellent opportunity for Ohio State to gather with alumni from our conference, show our “Big Ten Pride”, and support a race that first began right here in San Diego! The 2018 Rock ‘n’ Roll Marathon will be held on Sunday, June 3 and we will be hosting a water station at Boundary Street and Polk Avenue in North Park (around mile 7.5). We will be serving both the half and full marathons at this location, so we will be busy and need as many volunteers (ages 14+) as possible this year! Volunteers should arrive no later than 4:45 a.m., since our station is located early in the race. Our marathon support will be complete by 10:15 a.m. This is an event that is worth waking up early for, as there are MANY Big Ten runners in the races and our location will give us the best chance to cheer all of them on before they split into separate routes. Help us cheer on and pass out water to fellow Buckeyes, show our city how strong the Big Ten is and represent Ohio State amongst our conference! Enter Password: BigTen2018 (our station will only appear once you have entered the correct password). Select: W5 Big Ten (this will be highlighted in yellow underneath Sunday, June 3rd). Fill out the fields with your volunteer information. Enter Group Name: Ohio State (this affiliates you with the San Diego Buckeye group). Accept the waiver and sign the form. Please contact Chris Mordy (University of Michigan) at chris.mordy@gmail.com or Amy Parr (University of Wisconsin) at flink@uwalumni.com if you have any questions. Registrants will receive more detailed information in subsequent emails from the Water Station Captains as we get closer to the event.